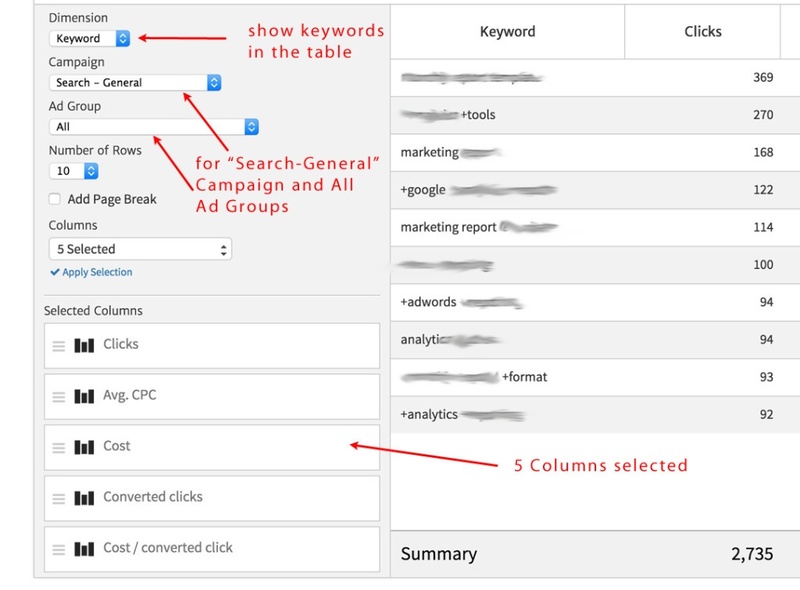 Megalytic provides a variety of widgets for including AdWords data in your reports. To see the available widgets, enter “AdWords” in the widget library search bar. You will see two sets of AdWords-related widgets. The orange-colored ones on top are Google Analytics widgets that access AdWords data through the AdWords account that is linked with a Google Analytics account. 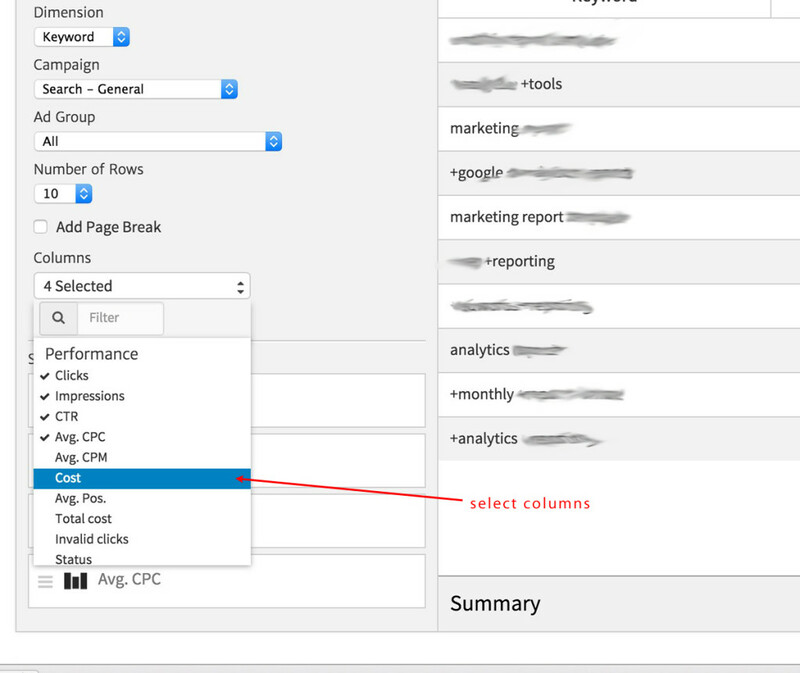 The names of these widgets are pre-fixed with “GA” to indicate that they are Google Analytics Widgets. The blue and green widgets in the bottom-half of the widget library are direct AdWords widgets. These widgets pull data directly from your AdWords accounts. To add an AdWords widget to your report, simply drag it from the library to the place in your report where you want to insert it. By default the AdWords Campaigns Widget displays data segmented by Campaign; and the default columns are: Clicks, Impressions, CTR, and Avg. CPC. 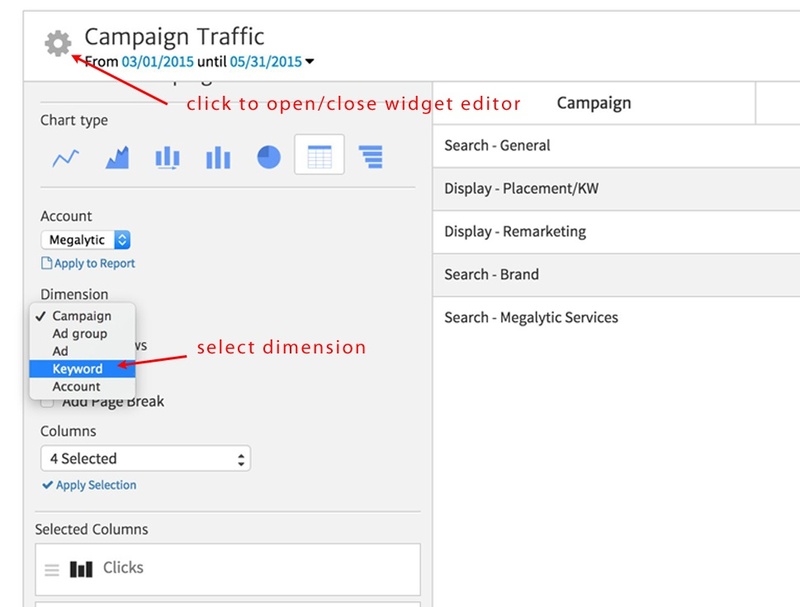 Instead of displaying data by Campaign, you can configure the widget to show data by either Ad Group, Ad, or Keyword. To do that, you simply click on the gear to open the widget editor and select the Dimension you want. From the widget editor, you can also change the columns that are displayed by picking up to 5 from the “Columns” selector. In this example, by changing the Dimension to “Keywords” and filtering on the Campaign “Search – General”, we have configured the widget to show the top keywords for the “Search – General” campaign. In addition, we have selected the columns: Clicks, Avg. 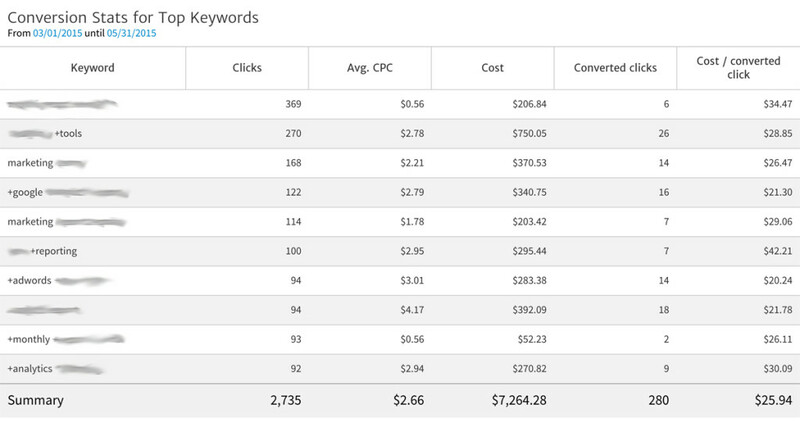 CPC, Cost, Converted clicks, and Cost / converted click. 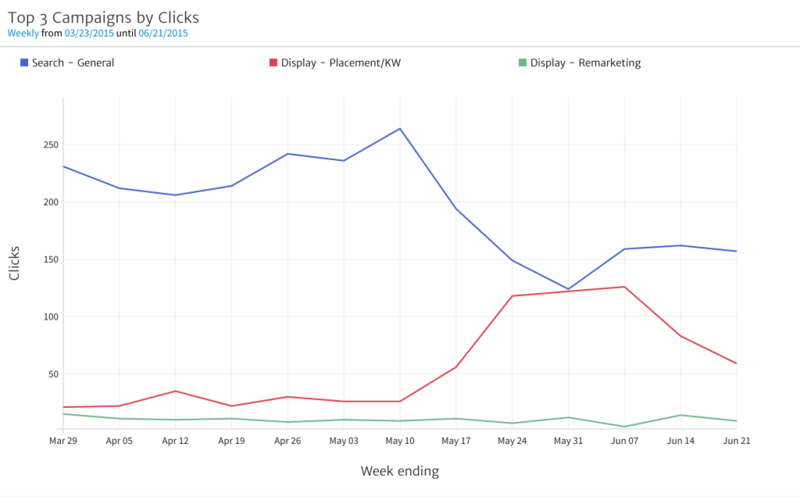 For example, here is the AdWords Campaign widget configured to show the top 3 campaigns using a line chart. For more details on how to configure Megalytic chart types, please see Working with Chart Types. AdWords KPI and AdWords Multi KPI Widgets. The two AdWords KPI widgets enable you to highlight specific Key Performance Indicators (KPIs) in a single widget. The example below uses the AdWords Multi KPI Widget to show Clicks, Cost, Converted clicks, and Cost / converted click for the last month. It compare these KPIs with the previous month, and the same month last year. For details on how to use the AdWords KPI and AdWords Multi KPI widgets, please refer to the documentation for the Google Analytics versions of these widgets, which work in exactly the same manner: KPI Widgets. The AdWords Networks widget is used to display AdWords data related to the Google advertising networks, AdWords performance across device types (e.g., desktop, mobile), and AdWords performance by click type (e.g., Sitelink, Headline). This widget works exactly the same way as the AdWords Campaign widget, but focusses on different dimensions. 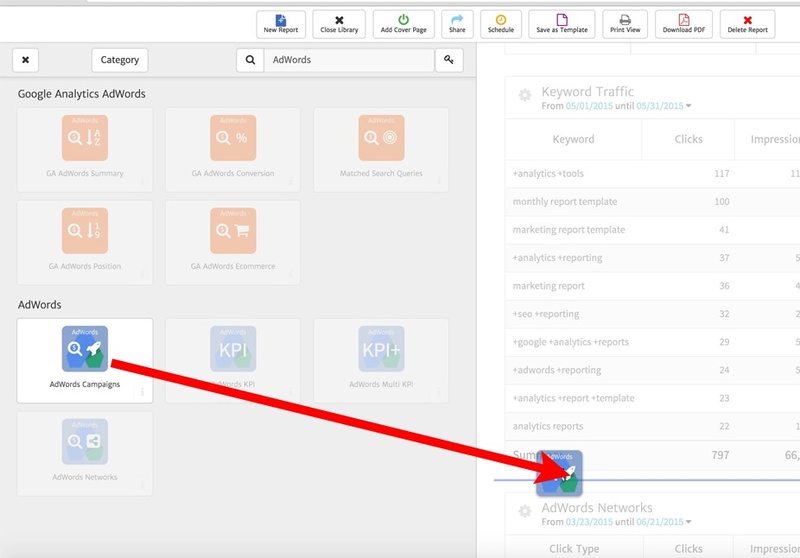 Here is an example of the AdWords Networks widget configured to show performance across the Google advertising networks. Likewise, here are examples showing the same widget configured to show Device Type and Click Type, respectively.